Working closely with conductor Fabio Luisi and Met prompter Carrie-Ann Matheson, Deborah Voigt was in her comfort zone in this performance. The voice still lacks core support in some passages, but she delivered thrills in the Act I scene where a drugged, disguised Siegfried robs her of the Ring, and the hair-raiding Vengeance Trio in Act II. She finished strong with a soaring Immolation Scene, although one wonders if this proficiency stems from a long history of singing this excerpt in concert. Her Siegfried was the Swedish tenor Lars Cleveman. He displayed a bright, ringing upper top that (in the first scene) turned shrill under pressure. Mr. Cleveman sounded best in the lower parts of this long role, improving as the opera went on. (His baritonal coloring made him quite convincing when disguised as Gunther.) He capped his performance with an entertaining Rhinemaiden scene, a movingly sung Act III narrative and death scene guaranteeing the hero a fine exit and enthusiastic applause. The German bass Hans-Peter König has been a linch-pin of this production, singing four major bass roles (one in each opera) in this spring's complete Ring cycles. Here, he was a firm, resonant Hagen with a thin veneer of good fellowship concealing this villain's gangster heart. Mr. König was particularly fine in "Hagen's Watch," one of the few solo scenes in the Ring. His Act II scene with Alberich (Richard Paul Fink) was played with dark colors and a murky, gloomy atmosphere that seemed to ooze out of the orchestra pit. Mr. König was flanked by two strong Gibichung siblings. Iain Paterson brings a tragic weight to Gunther, although his baritone sometimes struggled to be heard over the heaviest orchestration. Wendy Bryn Harmer reprised her strong Gutrune, making the love-struck princess more than just another victim of Hagen's schemes. As Brunnhilde's sister Waltraute, mezzo Karen Cargill made the most of her long narrative, where she fills her sister in on the imminent disaster facing Valhalla. In the orchestra pit, Fabio Luisi is not James Levine. And that's not a bad thing. The Met's principal conductor favors brisk tempos, cuing rapid deployments of Wagner's Jenga™-like stacks of leitmotivic material. The orchestra were in top form, with exceptional playing in the big moments of the score (the Rhine Journey, the Funeral Music) although they were at their most riveting in the long scene with Waltraute and Brunnhilde. 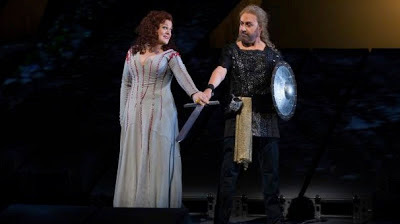 The Met chorus injected the show with fresh energy and good humor, with the drinking games of the Gibichung vassals a welcome contrast to the sense of impending doom that pervades this opera. “The Machine”, the enormous movable set that serves as scenery and projection surface for Mr. Lepage's digital visuals was (apart from a few creaks and clanks) on its best behavior when the curtain was up. (The start of Act II was delayed ten minutes for technical reasons).There is a certain pop-up book thrill at watching these 24 smooth geometric objects reconfigure themselves into castle vaults, Brunnhilde's fiery mountain (twice) the Rhine River and the Norns world-ash tree. At the end of the show, the planks lifted to reveal the entire Met stage crew, who received a thunderous and well-deserved ovation. Although the final tableau (depicting the destruction of the Gibichung castle and the burning of Valhalla) has improved since this production opened in January of 2012, the final conflagration remains curiously bland. As digital flames licked digital wood, replaced by digital floods, it carried a curious sense of promise unfulfilled. Perhaps this expensive show deserves better than the purgatory of the Met archives. Sure, it's not perfect. And it will never be as beloved as the old Schenk/Schneider-Siemssen staging. Consider this: is the act of spending (approximately) $50 million on four operas only to mothball the whole show after three season an even bigger folly than mounting the Lepage Ring in the first place?